Some say that Palm Cove Golf and Yacht Club in Palm City offers residents the best of everything! Anyone seeking the beautiful year-round sunshine and pristine waterways of Martin County will fall in love with Palm Cove homes for sale in Palm City. There are a total of 300 lucky families who live the palm cove lifestyle with a 92 slip marina on the St. Lucy river, clubhouse with huge heated pool, gym, tennis courts, 18 hole golf course, golf pro shop and the Palm Cove grill where you can enjoy lunch right on the golf course, and more. This is a non-equity membership club and you are not required to join any of the clubs. Most all of the amenities are included in your HOA fees! There are 48 townhomes ranging from 1500 sf – 2,750 sf living space under AC with 4 bedrooms and 3.5 bathrooms, many are riverfront. There are just over 230 homes set around a non-equity, 18 hole Chi Chi Rodriguez signature golf course, grille and pro shop. The golf course homes range from 2,500sf-3,000 sf, and there are also large 5,000 sf wide riverfront estate homes with views of the wide water. Finally, there is a group of smaller condominiums. So there are homes for every lifestyle and many homeowners will upsize or downsize without ever leaving Palm Cover and the friends they have made there. For the golf course, you can join the golf club for a minimal fee ( family memberships are about $1500/year), or pay as you play. Golfers at every skill level will enjoy this course, so challenge yourself while taking in the stunning surroundings. Following your game, you can stop into the Restaurant at Palm Cove for a delicious lunch or dinner with friends. Palm Cove Golf and Yacht Club is a family-friendly community which falls within Martin County’s A-rated school system. Plus, Palm City offers so many fine dining choices such as Ristorante Claretta, Palm City Grill, Maneros, Hokkaido Japanese and Sushi, Maya’s Mexican cuisine and Olympic Tavern Greek cuisine, just to name a few. Entertainment and cultural options are plentiful and varied, and shopping is easily accessible within minutes of Palm Cove. The area is abundant with activity, all within a few minutes of drive time! You are also 15 minutes from old downtown Stuart with all of its restaurants, ice-cream shops, and boutique clothes and art shops. Old downtown Stuart is dripping with charm from the 1920s and is also located on the river. It is also the home of the Lyric theatre which is a restored 1920’s silent film theater that now offers live shows and concerts all year long. 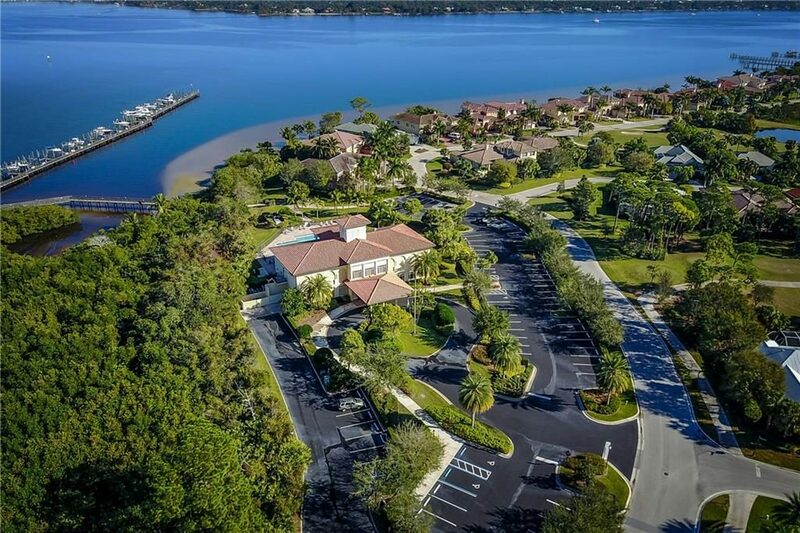 You are also located only 15 minutes from the Martin county hospital and the large network of health professionals. One wonderful feature in Palm City is that the Martin County Health systems have a large state of the art gym that is managed by the hospital and memberships are discounted if you live in Palm Cove. Palm Cove Golf and Yacht Club is a guard-gated community in Palm City. It is set on the wide waterway of the St. Lucie River offering beautiful water views, as well as access to the Atlantic Ocean. Dock your boat, up to 60 feet, in their private marina. There are 92 boat slips and they are owned by families in Palm Cover. There are always slips for sale running from $25k-$40k. The single-family homes, townhouses, and condos in Palm Cove are spacious and well-built ( all are CBS construction i.e. cement ). They have been built between 1998 and 2006. Buyers can find recently renovated homes for sale in Palm Cove with luxurious finishes and modern upgrades. They range in price from the $300s to over $2M. The Home Owners Association at Palm Cove is solid and stable. How Much Is My Palm Cove Home Worth? If you already own Palm Cove real estate and would like to know exactly how much it is worth in today’s market, The Jack Coden Group would love to help. We specialize in Palm Cove Real Estate in Palm City, Florida. Don’t settle for less than the best when you choose a Palm Cove Realtor to sell your waterfront home now. Find out how much my Palm Cove home is worth now!